Every comedian will tell you that they start out basically doing an impression of the comedian they like. Woody Allen has famously said that all he did was rip off Bob Hope in his early movies. For me it was Robin Williams. 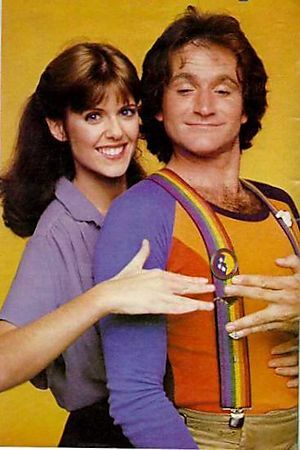 And specifically it was Robin Williams as Mork. But that only goes so far. That’s when I also learned there was some funny in me and I would make stuff up. I took an acting class in high school. One day something happened where I was on stage (meaning the front of the class) and the teacher had to step out for a moment. I started riffing. Just making stuff up. And people laughed. A girl that have never paid attention to me laughed and ended up flirting with me. It’s always about the girl. Right about the same time, the movie Meatballs came out with Bill Murray. And I stole from him. I was a combination of the two of them, reciting the lines and then expounding on the characters of the wild and crazy, the smart aleck, the witty. Inspired by where the two men had came from I studied improvisation from teachers of the Second City, Annoyance and others in Chicago. I ended up finding my own style and I’ve had my own career. But it started with Robin Williams. I am very saddened by the news of his death but just as much as the loss it’s the battle that he lost that saddens me. From reports and his own accounts in interviews in recent years he faced addiction again and I know first-hand what a struggle that can be. Unfortunately, it may be that he lost the battle between the rational and irrational mind. And that’s too bad. We are very fortunate that there are accounts of his brilliance and roles that showcased his talents left for us to enjoy. Besides Mork and Mindy, films like Dead Poets Society, Good Morning Vietnam and Mrs. Doubtfire were the perfect vehicles that allowed his talent the space to explore, explode and entertain. He will be missed, I hope his soul has found peace.